Let the girls camp in the backyard in tents. 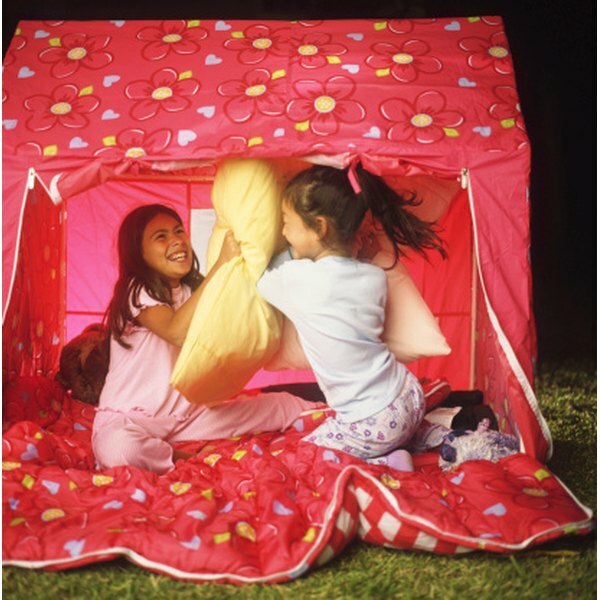 Host a slumber party for a group of girls of any age for a birthday party or just a friendly overnight get-together. The last thing a group of girls wants to do at a slumber party is sleep, so have the girls help out with dinner and dessert, and plan a variety of take-home activities to keep the girls occupied and to use in place of traditional party favors. Purchase theme-related invitations or make the invitations at home with the help of the hosting party girl. Simple slumber party invitation ideas include cardstock cut into the shape of the moon, stars, a sleeping mask or miniature stuffed animal with the invitation details written on a piece of cardstock and attached with a ribbon. Parents can also make fabric invitations in the shape of a pillow. To make the pillow invitations, cut two rectangular pieces of fabric and print the party details on one of the pieces with a fabric marker. Sew together three sides of the two pieces of fabric with the right sides together. Turn the fabric right side out, stuff with cotton batting and sew up the final seam. Divide the party room into two areas, one area for the evening’s activities and one area for the girls to set up their sleeping bags or air mattresses. Decorate the entire party area with balloons in the girls’ favorite colors and hang glow-in-the-dark stars from the ceiling. Surround the ceiling with strings of twinkling lights. Hang a large piece of pink gossamer, silk or tulle fabric from the ceiling to cover a section of the wall for the girls to host a fashion show. 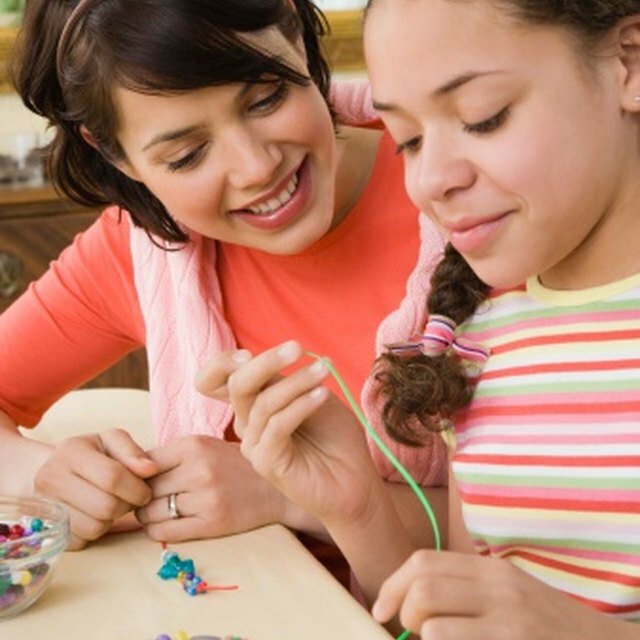 Organize a variety of age-appropriate activities for the slumber party group. Purchase some inexpensive pillowcases before the party and have the girls decorate the pillowcases with fabric markers and glitter. For a summertime slumber party, have the girls decorate pairs of flip-flops with ribbons, fabric, pompoms and feathers. Other craft ideas include turning ordinary wooden boxes into decorative jewelry boxes and beading jewelry crafts. For a group of girls who love beauty and fashion, provide each girl with a hair, nail and makeup makeover. Afterward, have the girls make a jarful of body glitter to bring home. To make the body glitter, the girls combine a cup of aloe vera gel with a tablespoon or two of fine polyester glitter. Add a couple of drops of an essential oil for a scented body glitter. For dinner, parents can have the party group assemble their own personal-size pizzas from a variety of toppings, such as pizza sauce, cheese, pepperoni, green olives, onion, pineapple and bacon. For a party group of older children, preteens and teenagers, turn the evening’s dessert into a make-your-own project as well. Have the group work together to make a batch of cupcakes to decorate with icing, sprinkles, candies and chocolate. For a younger party group, have the cupcakes made ahead of time for them to decorate under adult supervision. For breakfast, serve a stack of pancakes and let the girls choose from toppings, such as maple syrup, chocolate and butterscotch sauce, whipped cream and fruit.